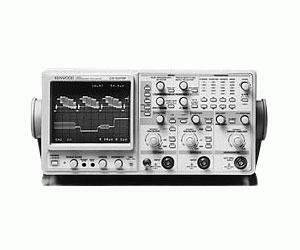 The CS-5370P is 2-channel Oscilloscope with high functionality and accuracy and easy operation. The CS-5370P is a fully-featured instrument with ±2% high-accuracy measurement, delay sweep function, automatic triggering and a high intensity, high-resolution CRT. The vertical axis sensitivity can be varied continuously from 1 mV/div. to 5 V/div. using the 1-2-5 step attenuator. The 1 mV/div. position is very useful for measuring low-level and complicated signals.